(NewsUSA) - Sponsored News - However you stack 'em or slice 'em, everyone loves a good sandwich -- especially when it incorporates healthy ingredients. Americans everywhere are looking for quick solutions on making healthy diet choices, and many will be happy to hear that this doesn't require a whole meal overhaul. In honor of National Sandwich Day on November 3rd, here are some fun twists on sandwich classics that can help you incorporate easy ingredients for guilt-proof lunch solutions. * PB&J Quesadilla: PB&J's are an American favorite. To cut down on the high fat, calorie and sugar counts in typical peanut butter and jelly, sub in almond butter paired with fiber-full fresh strawberries and bananas. Wrap it all up in a whole wheat tortilla to cut carbs, throw it on a skillet and make your taste buds sizzle. * Wild Turkey: According to a recent study, turkey takes the cake for America's most popular sandwich, but can sometimes get a bad rep if it's piled up with fatty toppings. For a healthy new take on the classic club, ditch the fattening mayonnaise and bacon and trade it with almond butter and apple slices instead. This healthy upgrade also lends some crunch and sweetness to your sandwich. And remember: not all meats are created equal. Look for turkey that is lower in sodium and fat, without sacrificing flavor. 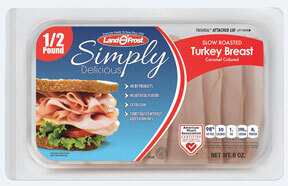 Simply Delicious Slow Roasted Turkey Breast from Land O' Frost is a great option and certified by the American Heart Association's Heart-Check Food Certification Program, making it the perfect option for you and your family. * Green Grilled Cheese: Get your daily dose of greens and dairy with this healthy spin on everyone's greasy, guilty pleasure. Pack your grilled cheese with avocado, spinach, pesto and parsley for a substantially more nutritious and flavorful sandwich. Better yet, substitute your go-to, boring deli cheese, with goat cheese, which is extra creamy and surprisingly low-cal. Feel free to experiment with any of your favorite veggies -- it's what's on the inside that counts, right? This National Sandwich Day, try out any of these creative transformations with your family, or use your imagination to invent a new, unique concoction of your own. For coupons and healthy recipe ideas for the whole family, visit www.landomoms.com.